In Kenya, high school education is not free, often making it impossible even for very qualified young people to complete their education. And yet most opportunities are closed to those who have not completed high school and taken the national KCSE school leaving exam. FAITH HOUSE offers each one of our students the opportunity to finish secondary school and to explore the unique gifts and interests that will enable each girl to flourish and serve in our competitive world. is a fourth-year medical student at Kenya Methodist University. Her dream is to be a surgeon, but after serving with a group of American doctors on a medical mission trip to Tanzania, she says that when she completes her medical training, she wants to be a medical missionary. a diploma course in Fashion Design. Anne completed her high school studies in November, 2018 and is working with Beatrice to find her next steps. is working toward a diploma in catering and food production. She is gifted in the kitchen and is doing well in her studies. Whenever Effie is at home at Faith House, she is in the kitchen, baking, trying new recipes, always surrounded by other Faith House students who learn from her. has a tender and creative touch, encouraging those who receive her care. She is working toward a diploma in Beauty, Cosmetology and Hair Design, receiving practical training in her program. Abigael completed her high school studies in November, 2018 and is working with Beatrice to find her next steps. has a playful sense of humor and an inquisitive mind. She is has completed a certificate in early childhood education and hopes to continue her studies, working toward a diploma in special education. She is a gifted teacher and her heart's desire is to help some who cannot help themselves. is pursuing a diploma in photography and videography. Her creative gifts include her developing computer skills and real musical talent, often leading worship in her church. including videographic production and animation. has a real gift for math and science. She considered studying engineering but decided to pursue secondary education in chemistry and math. She has tutored her Faith House sisters and they report that when Prisca teaches them, chemistry makes sense. Faith House began in 2007 with fourteen girls who had been a part of the earlier ministry of Rafiki Girls Center. Others came to Faith House later. Some came only for short times and with some we have lost contact. Yet many remain a part of the Faith House family as mentors, friends, encouragers of the younger girls. We have watched the girls grow into beautiful young women. We have watched them finish high school and university. We have watched some marry and build solid homes of their own. We are beginning to see young families blossom as a new generation is born, full of hope. And we are watching these young women finish the education that once seemed beyond them. Their very special talents and gifts are being developed and used in careers and in service to others. Jane earned her Registered Nurse diploma from Kijabi Mission Hospital in 2015. 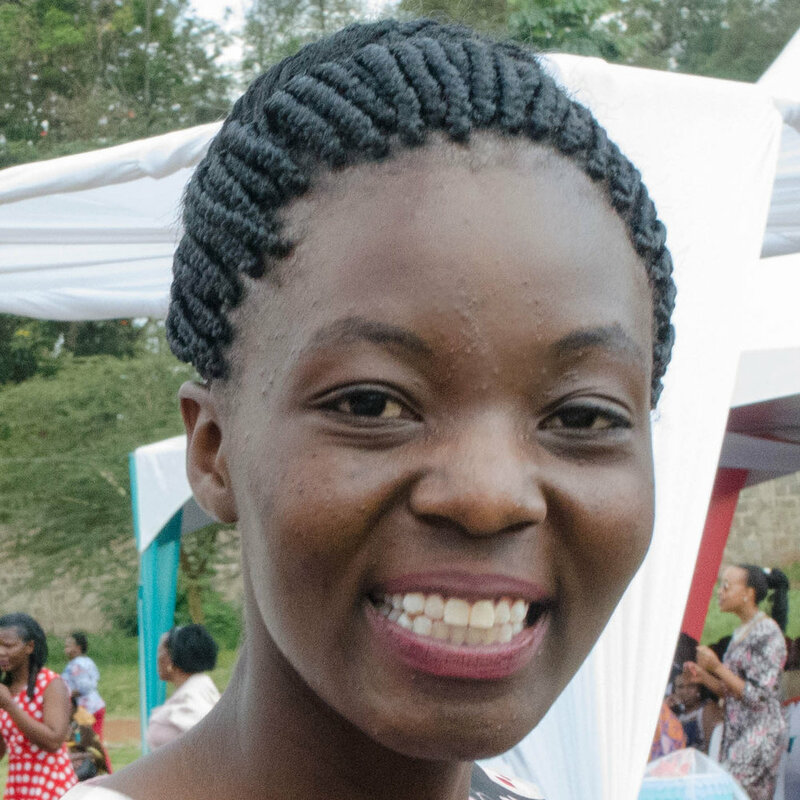 She worked in the hospital for two years and is now a student in Daystar University in Nairobi, working on her Bachelor of Science in Nursing. In October, 2017, she and Teresa were invited to participate in a medical trip to Kigoma, Tanzania with a team of doctors and nurses from Kingwood United Methodist Church, Kingwood, Texas. Her wisdom, experience, and sweet spirit proved invaluable to the Americans as well as to the missionaries in Kigoma. Zipporah (Zippy) was one of our first Faith House girls, and one of the first to graduate from university, finishing with a Bachelor's Degree in Actuarial Science. Zippy and Daniel were drawn to each other by a shared love for the Lord and by a common desire to serve those in need . Daniel had grown up a "street kid" and had started a ministry to help other "street kids," while he was still in school. They married in 2015. Today, Zippy helps manage Daniel's Impacting Lives Foundation while caring for their baby son. Margaret received a diploma from Mt. Kenya University to become a Dental Assistant. She has worked in dental clinics in central and eastern Kenya as well as in Nairobi. She is resourceful and a capable worker, doing well in her field. One day she hopes to complete her Dentistry Degree. In October, 2014, Grace graduated from St. Paul University outside of Nairobi. She finished with second class high honors, receiving a Bachelor of Business Administration with a specialty in Procurement. She was the first in her family to attend university. Grace is an entrepreneur and a go-getter, using her degree to engage in businesses of her own design. She married in 2017 and they are expecting their first baby in early 2018. Following the death of her parents, Margaret was raised by her precious grandmother. It was the grandmother who encouraged Margaret to do well in school, to keep trying even when disappointments came. And Margaret has learned well from her grandmother. She graduated from Daystar University in 2015 with a Bachelor of Arts in English and Education and was selected the outstanding student in that program. She is currently completing her Masters Degree in Educational Counseling. She married Jones in June and is now working in a local counseling ministry that focuses on orphans. Margaret has blessed Faith House with her supporting presence in the lives of the younger girls. She is their mentor, their "older sister" and their friend. Veronica graduated from Jomo Kenyata University of Agriculture and Technology (JKUAT) in 2017, with a Bachelor of Science in Financial Engineering. She explains that the program is highly technical, cutting edge computer programming and development. For a time she worked for a small start-up company and is now working for an accounting firm as an accountant’s assistant. She has been extremely helpful at Faith House while Beatrice has been on maternity leave. Of all of our girls, Maureen has had the most challenging path through a very confusing educational system. And yet she has lived out total perseverance with every twist and turn. Maureen has a curious mind, a deep determination and an intelligence that enables her to excel. In March of 2017, Maureen completed a diploma course at Riara University in International Studies. She was the top graduating student in her program. She is now a student at African Nazarene University on a special scholarship, working on a degree in International Studies, specializing in Peace and Conflict Resolution. Every term she is the top student in her class. Sheila has a funny sense of humor, bringing joy and laughter into every situation. In 2017 she earned a diploma in Human Relations. She is hoping to gain practical experience in the field before working on an advanced diploma.